Trip Organized by RTA in calibration with EAVI, gave an opportunity to around 50 visually impaired members of the association to experience Dubai’s widely hailed project, Dubai metro. Before boarding the train Mr., Abdullah Madani, director of technical Support briefed the members about the services for disable in general and visually impaired in particular. “The name of the next station is announced and measures have been taken to make the movement of visually impaired easier inside the stations”, informed the official. The visiting member gave various suggestions to improve the accessibility of the service. Using Dubai metro services, members reached to Ghubaiba station and experienced Dubai fairy for two hours. Members were presented with freshments. RTA officials encourage them to fully utilize the Dubai transport facilities. In efert to insure that its members have access to world’s biggest online library for visually impaired and print disable, last year EAVI partnered with www.bookshare.org, enableing interested members to enjoy a large collection of books in a variety of accessible formats. This year association went one step ahead by providing a daisy player to its bookshare members. Recently a training workshoppe was held to help the users of the device take full advantage of all the functionalities of the player. Mr. Ali Abdul Rahim, engineer at Nattiq technology, demonstrated the use of the device to the members who appreciated this stepp of the association. One of the BookShare official Ms. Robin Seaman visited EAVI and met with president EAVI, Adil Alzamar, and Dr. Ahmed Alomran and discussed about services of BookShare, an online library which offer a growing collection of books in accessible formats to print disable all over the world. A member can download the available titles including newest releases in a variety of formats including braille, audio mp3 and daisy text. The online library has hundreds of thousands of books to offer to its subscribers. She was briefed about the mesures taken by the association to make it easier for the BookShare members from UAE to read the books including provision of special devices for the purpose. His Highness Shaikh Mohammad Bin Rashid Al Maktoum, Vice-President and Prime Minister of the UAE and Ruler of Dubai, has hoisted the UAE flag at the Union House in Dubai on November 06, to mark President His Highness Shaikh Khalifa Bin Zayed Al Nahyan’s accession as President of the UAE. The ceremony came as the UAE celebrated its 6th Flag Day by hoisting the nation’s flag at public and private buildings at noon. Chairman board, Mr. Adil alzamar, Mr. Abdu Rehman, Manager and Mr Muhammad Al ghafli, Chairman of the Committee on Information and Public Relations represented EAVI and its members in the event. In an effort to educate teachers and parents of the visually impaired about the problems of VI and their possible solutions, EAVI organized a meeting at the association premises with them. A large number of family members, peers and parents of VVI members attended the meeting along with them. Chairman association, Mr. Adil Al-Zamar and his deputy, Dr. Ahmed Alomran, Professor Ahmed Mukhtar and Ms. Salma Al-Kaaba spoke on the occasion. To assess the outcome a questioner was also distributed. This initiative was widely appreciated. The event was attended by chairman of the Association Mr. Adel al-zamar and Director General Abdul Rahman Al Bastaki.. .
Organised by Sightsavers Middle East in partnership with the Prevention of Blindness Union (PBU), the forum discussed avoidable blindness and the major role that the GCC can play in saving and protecting the vision of people in developing countries. Abdullah Al Nuaimi, Director-General of Sightsavers Middle East, said estimates showed that there were 285 million visually impaired people in the world, of whom 246 million had low vision and 39 million were blind. He mentioned that number of blind people might rise to 76 million by 2020. Other speakers addressed avoidable blindness in the developing world, the importance of early intervention and the roles of GCC member states in making a life-changing difference to people in some of the world’s poorest countries. The event brought together more than 200 experts and representatives of 65 local, regional and international organisations from 13 countries. Like every year, EAVI organized a host of activities to celebrate white cane day on October 09, 2013 this time, to spread awareness about visually impaired in the community. A large number of its members and people from civil society attended the event. In this connection a walk was also organized to highlight the importance of the day. It was started at 05:00 in the evening and was attended by institutions including Sharjah Police, Sharjah City for Humanitarian Services, Dubai Center for Volunteers, Emirates Volunteers Association and Dubai Club for Special Sports. This walk was followed by a ceremony held to honor all the stakeholders for their contribution to make this event a success. At the end, chairman of the association Mr. Adel Al-zamar and his deputy, Dr. Ahmed Al-Omran thanked the guests for their participation. On 19th of Ramadan, to mark the Zayed Humanitarian Day, Emirates association of the visually impaired (EAVI), in collaboration with the Department of Tourism Development organized a panel discussion and gathering of hundreds of its members, their parents and friends at association headquarters. The main focus of the discussion was the uplift and well fair work for blind done in his era. Mr. Adel Al Zamar, Chairman EAVI and Mr. Faisal Al Nuaimi, Director General of the Department of Development and Tourism inAjman, praised the support and kindness of late founding father of UAE for the differently able people in the country. They recalled how the work started in late eighties and the establishment of specialized centers for handicapped as well as different stages that this association went through to become what it is today. The session was moderated by Dr. Ahmed Al-Omran Al Shamsi, Vice president of the Emirates Association of the Visually Impaired. Others who spoked on the occasion include Mr. Ahmed Mukhtar, Association member and a teacher for the blind, and Mr. Ibrahim Alkhaial, member of the Association and the employee in the Sharjah Educational Zone and Mr. Khalid Busaham, teacher at the Ministry of Education. A number of different competitions and meal was also arranged for the guests on the day. 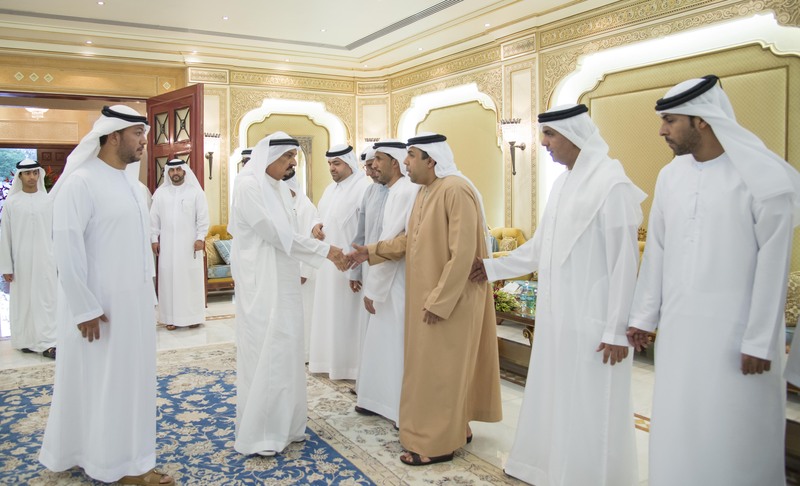 His Highness Sheikh Humaid bin Rashid Al Nuaimi, Supreme Council Member and Ruler of Ajman, and a delegation from the Emirates Association of the Visually Impaired, led by the President of the Assembly and his deputy on Ramadan 19 (Zayed Humanitarian Action Day UAE). His Highness said that the best we can do in memory of the death of Zayed goodness is to recall and remind the world what he has done humanitarian work throughout the period of his life, a man is tall giant white hands extended, which contained the whole world east and west north and south through the lend a hand goodness and help the needy, without exception, and without regard to race, origin or color or religion. This came during a breakfast hosted by His Highness the Ruler of Ajman inAlmazharPalace, inAjmanattending by HH Sheikh Ammar bin Humaid Al Nuaimi, Crown Prince of Ajman, which hosted a delegation of the Emirates Association of the Visually Impaired in Sharjah. For their part, praised the President and members of the Emirates Association of the Visually Impaired role of the Ruler of Ajman in the support and care for his children blind in particular and those with special needs in general and invited to have breakfast with his On Zayed Humanitarian Action UAE, pointing out that this generous gesture unprecedented stresses his eagerness and his quest to secure the special needs of those groups which contributes to increase their abilities and give them opportunities to live within their community to individual shareholders in the construction and progress. They pointed out that the support provided by the state to all associations and institutions that sponsor activities and programs for this segment and social care and support for people with special needs, specifically the blind beyond description and has no parallel in any other country through the provision of services, treatment and rehabilitation, training and follow-up of actual and permanent for each individual case and that work on increased integration and communicate positively with their peers in the community. Following the meeting, His Highness Sheikh Humaid bin Rashid Al Nuaimi, taking souvenir photos with members of the delegation of the Emirates Association of the Visually Impaired.